A Maine family practice physician who takes time to listen! The Village Doctor is part of a movement in medicine towards patient-centered medical care. Dr. Newman works to build trusting relationships with patients. If needed, he acts as a facilitator for patient care, coordinating with other medical providers who may treat the patient. If you&apos;re feeling ill or just want a routine check-up, schedule an appointment today. Visit with the doctor in a relaxing and comfortable home office environment. Promote health and well-being, prevent illness, and treat various medical conditions. Schedule an appointment to discuss the use of medicinal marijuana as a possible treatment. Hypo-allergenic nutritional supplements by Pure Encapsulations. I will spend an hour listening to your medical history and current needs. I will not be typing at a computer, answering the phone, or allowing interruptions. I will keep your medical chart confidential - only I will see it. I can provide or recommend natural therapies, such as acupuncture, chiropractic, supplements, or nutritional therapy. I will work with your current doctor to coordinate an effective treatment plan. The Village Doctor in Winter Harbor, Maine is currently accepting new patients. 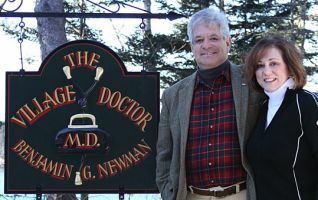 Dr. Newman provides patient services to the people of Downeast, Maine and throughout the state. If you are a medical provider, please contact us to find out how we can work with you to coordinate patient care.